Sometimes it is only when you see a person in real life that you have a full appreciation of them. I had often wondered why Kathy Jackson seemed to be able to charm so many seemingly intelligent men. When I say intelligent, I am not referring to Tony Abbott of course. Standing outside the courtroom, I see Jackson for the first time, she is talking to some men. She looks absolutely radiant I have to say, she has an air about her that is hard to define. Her eyes radiate warmth, her skin has a flawless quality, and every move seems to be done with such grace. I instantly understand the attraction. That’s when I realised, it wasn’t actually Kathy at all. When I finally do see Kathy for the first time, she has a look on her face that would curdle milk. Still, it is no wonder she is looking decidedly less than confident. Deep lines on her forehead seem to suggest there has been a lot of frowning over the last few weeks, and I don’t blame her. Things are not traveling well for her. Not well at all. Independent Australia, and Wixxyleaks have produced leaked documents that raise questions over her integrity, and her financial practices within the HSU Number 3 Branch. On top of that she has the Federal Court case, which has been rapidly descending into farce. 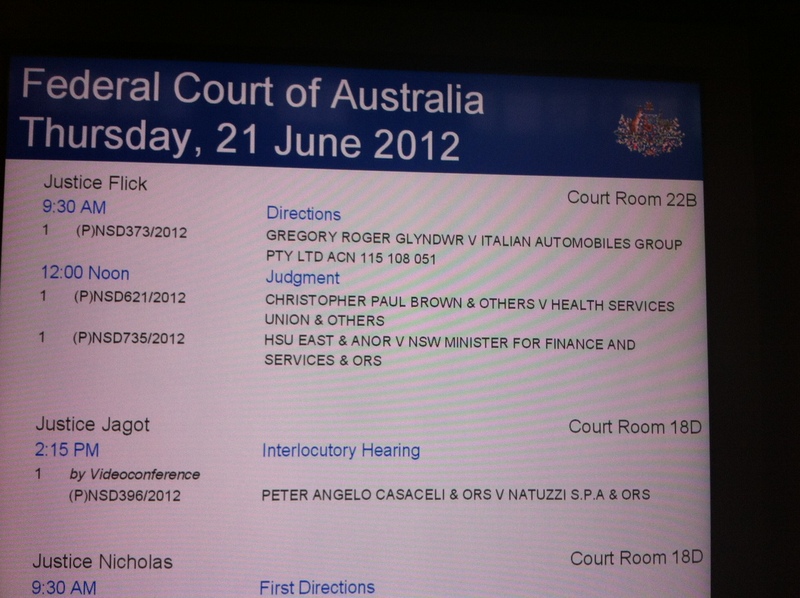 Today, we are all in Sydney’s Federal Court for the finale, and it’s standing room only for latecomers. Today is the day that Justice Flick hands down his judgement. There is a sense of anticipation in the air. Many are surprised to see that Kathy is still being represented by QC Rofe, after his hasty departure at the previous court appearance. Rofe is the QC associated with Michael Lawler, Vice President of FWA and Jackson’s partner. The handing down of judgement is delayed by Rofe once again attempting to request that Justice Flick read Jackson’s affidavit prior to handing down judgement. Rofe explains that the affidavit has vitally important information, however when asked repeatedly about this information by Flick, it becomes painfully clear that Rofe hasn’t even read it himself. There are sniggers and chuckles throughout the court from press and spectators. In the end nothing can stop the judgement, and Justice Flick rules that the union be broken up. for those interested, Frances Jones has published a detailed account of the court proceedings. Outside court, HSU National Secretary Chris Brown faced the waiting press. Brown said he was happy with the court’s decision, and agreed with Justice Flick that it was the best thing for union members, and would give members the opportunity to decide for themselves who runs the union. Asked about the questions being raised regarding Jackson’s integrity, Brown said he was of the opinion that Kathy should welcome any investigation, if she was confident it would clear her name. Kathy Jackson’s press appearance raised a couple of interesting points. When asked about if she was doing anything about her pay dropping to $150K from $270K as a result of being stood down as the secretary of HSU East, she stated that she was looking into that and planned to address it. It seems that since her appearance on 7 30 a couple of weeks ago, where she stated that she wanted to have her pay cut by $100K, she has had drastic change of heart. Quite drastic. Kathy then told the press that she was “quite surprised by the judge’s decision“, she then went on to say that “the membership should decide whether there should be a demerger of the union or whether we should stay together as one big union”. I can only assume from that statement that she feels a Federal Court Judge should not have the authority for this ruling. She also forgets the overwhelming vote by union members at the 2011 convention, was for a demerger, and for Jackson to stand down. If she was serious when saying the members should decide, she would have resigned back in 2011. After the crowd dispersed I was approached by Andrew Lillicrap, who wanted to discuss my previous post. Andrew wanted to give his version of the events I described previously. Andrew told me that he is certainly not a supporter of Jackson, and insisted he was just being polite when he greeted her earlier this week. Andrew explained there was no smooch, or kiss, just a polite handshake. Andrew did however confirm that he and Jackson had a sit down meeting, something Kathy had Federal court orders not to do, at the Sydney HSU office. Lillicrap however denied that the meeting was held behind closed doors. I explained to him that I reported the event, not for the greeting, or for the door, but for the fact the meeting took place. I have to say, Lillicrap came across to me, in the few minutes we were together, as quite genuine. He gave me his contact details, and said he was happy to talk to me at any time. After speaking to Lillicrap, I noticed Jackson sitting on a park bench with her sole supporter. Prodded along by my wife Felicity, and Frances Jones, I decided to introduce myself, and see if she wanted to answer some of the questions I had raised. Walking over, I said “Hi Kathy“, shook her hand and introduced myself. “You seem to be under the false impression that I am part of a Williamson conspiracy against you” I stated to her. “I can assure you that I am not, and I do not even know Mr Williamson” I responded. “You just are” she stated. As I tried to let her know that I am happy to listen to any explanation, or publish any evidence regarding Williamson, she walked off. 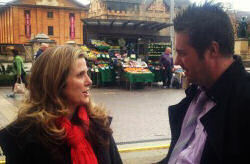 As she walked past, Felicity tried to explain she was wrong with her conspiracies about my allegiances. As Kathy walked off by herself, she looked a strangely lonely figure. I actually felt a little sorry for her, knowing her world was starting to crumble around her. Only for a minute though. My day in town finished with a coffee with my wife and Chris Brown. As we sat in front of Parliament House sipping tea and coffee and chatting, NSW Firefighters were protesting next to us, after O’Farrell and the Coalition had butchered their workers compensation scheme. In a way it was kind of fitting, sitting there with Brown, a man trying to hold a union together for its members, while another union was running a rally right next to us. I couldn’t help but think how much Chris must long for the day when he can fight for his members rights, rather than being stuck in a courtroom, or meeting lawyers. I hope Chris hasn’t lost sight of the fact, that what he is doing is fighting for his members. He is just fighting a different enemy. Upon arriving home, I read the Financial Review, not something I would normally do. I went through the articles that delved into the Jackson affidavit that was leaked in defiance of Federal Court orders. Kathy Jackson’s signed affidavit contains an admission that she “secretly tape-recorded executive meetings of the HSU”. This is highly illegal. Even police have to ask before recording a conversation. Call it a hunch, but I don’t think this is the last time Kathy will see the inside of a courtroom. You’re a funny fella Wixxy. Well done Peter, Felicity and Frances – am looking forward to hearing the outcome from today. She will never be able to claim you didn’t allow your readers to hear her side of the story. I always wonder whether people who see a conspiracy around every corner do so because they expect others to act as they do. Sadly I don’t know that Jacksonville is such an unusual place. It seems to be just one of the many that privilaged and gated communities that seem hell bent to take from workers at any expense these days. “Truth Seeker” what a great ( and deserving) title to hold ! Left a comment at Vexnews saying Goodonya to Frances Jones & them, asking them both to keep it up. That applies to you as well, Wixxy. Things do seem to be rapidly falling apart for Kathy Jackson, thanks to you and your family, Independent Australia, Frances Jones and Vexnews. Union members and all fair minded Australians owe you a big vote of thanks and lots of praise..
Peter, intrigued by the interim Temby report into HSUeast finances. There was nothing in that report concerning Vic no 3 branch. Do you know if that was beyond Temby’s mandate? I heard it was Jackson who insisted that the bar association appoint the auditor and Temby was available. That the Vic branch was untouched by the report is interesting. Surely the merger of the vic branch would have put its financial history within the range of Temby’s investigation? Nothing sinister suggested of course, but given the lack of scrutiny of the sort of material you’ve been publishing – worth asking about? CHRIS UHLMANN: Kathy Jackson’s crusade has uncovered disturbing practices in her union and only the police are in a position to decide if it amounts to criminal behaviour, but her own use of union funds is now being questioned. CHRIS BROWN: Given the accusations are there, on face value they’re reasonably serious, then Kathy deserves the right to have those – that independent investigation either clear her or actually confirm that there are some problems there with the finances of the number three branch when she was secretary. Yeah, pity Kathy didn’t give anyone else a fair go. 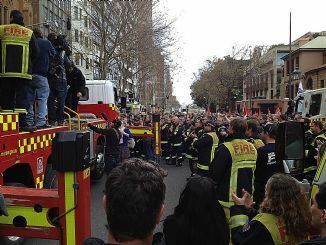 Abbott has nothing to worry about from any complicity Jackson may have in misuse of Union funds. First, the ‘Thomson as scumbag’ story is entrenched in the public mind. Nah, Abbott is home clear on this. Whilst Abbott may wash it off, he has previously gone on record as stating his admiration for Kathy Jackson. His current silence about the whole affair is obviously a strategy to distance himself. However – I am increasingly inclined to believe that this will never go anywhere in terms of causing sufficient pain to the opposition. It should, but it probably wont. My only hope is that the political strategy is to slow cook the offenders. Wixxy, can I ask – are you banging your head on a wall about lack of MSM/Poli action OR is it all meeting your expectations? This might not wash off so easily though. Seems Ashby was writing the lewd texts and pretending it was Slipper doing it. Finally, someone is doing their reading. Hey Wixxy, someone has finally acknoweleged your efforts regarding the HSU debacle..
Acting HSU President Chris Brown believe police should investigate “masses of internal documents”. It evens mentions the credit card statements on the IA website and some of the seemingly dodgy payments made by the branches run by Kathy Jackson and her ex. Yeah poor widdle Kaffy, nowhere left to hide. Hope there’s some left of that antiseptic of public scrutiny she was banging on about in rosier times. Only Kathy is allowed to do smear campaigns it would seem. Well done Peter for getting the papers finally into someone sensiblé’s hands. Good to see Peter Reith is still quoting her in today’s piece on the Drum. Hopefully some mud will stick on him and the HR Nichol Society. Well done great work in getting all the missing details and finally there may be a though investigation and pull the right people in front of the High Court to answer these charges ? Two more news stories I noticed today. Mr Thomson says the documents back up his claims Ms Jackson is not a credible witness to allegations he misused union funds. “How could Fair Work have all of these documents yet not make any comment on them in relation to the Victorian investigation, yet spend hundreds and hundreds of pages talking about similar issues that I was alleged to do?” he said. I would say he’s asking a perfectly reasonable quesiton. One I think the HSU members deserve an answer to.